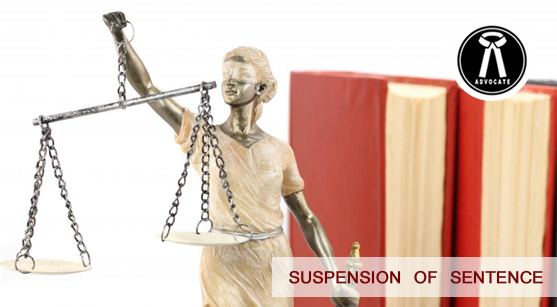 Suspension of sentence is the suspension of imposition of sentence after conviction or plea of guilty for determinate and reasonable period. It is the postponement of the judgment of the court temporarily or indefinitely. In a suspension of sentence, the conviction and the disabilities arising there from remains and it become operative when judgment is rendered. When the sentence is less than three year , then the applicant can move the application for suspension of sentence before the same court who convicted the person and when the sentence were more than three year, in that case person can approached the higher court for suspension of sentence. 1. Power of Judicial Magistrate – Judicial Magistrate has power to suspend the sentence to the extent that period of one month for giving the appropriate time to the accused to file an appeal before the appellant court against the order. 2. Power of Session court – Session court has also power to suspend the sentence to the extent that period of one month for giving the appropriate time to the accused to file an appeal before the appellant court the order. 3. Power of high court – High court has a vest power of suspension of sentence as compare to the lower courts. In generally high courts not heard the fresh appeal at same time and admit the appeal. But high court give the chance to the appellant for pressing his application of suspension and if high court found merit in the application for suspension then grant the bail to the accused till the pendency of his appeal. Suspension of sentence is different from the regular bail. Regular bail is always granting during the pendency of the trail which facing by the accused person and suspension of sentence is granting after the judgment of conviction and suspension of sentence is depend of the length of sentence, period of conviction in which person remain behind the bar and nature of offence.